Wedding Wishes UK: Wedding Wishes Ideas from the Wedding Ideas Awards! Wedding Wishes Ideas from the Wedding Ideas Awards! 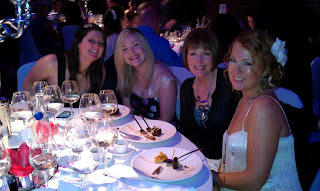 I have to admit, I was a little bit apprehensive about going the Wedding Ideas awards last Friday ... Here at Wedding Wishes UK, we're a two-person team. Unfortunately my business partner, who works with, and has some understanding of the UK wedding suppliers industry, had to pull out of attending the event at the last minute, leaving poor old geeky me (I'm the technical half of Wedding Wishes UK) to brave the event alone! In the end I needn't have feared. The lovely ladies on my table made me feel very welcome, despite the fact that I was the only man at the table. As well as being great company, they also offered me lots of interesting ideas on things we could to do make Wedding Wishes UK a compelling tool for brides, as well as some great tips for promoting the site. It seems that the Wedding Wishes iPhone/smartphone app concept was very popular, so this is clearly an area we need to work on as a priority. What hadn't ocurred to me before was the idea that the app could be valuable even before the directory is stuffed full of supplier listings, by initially focussing the mobile app on the bride's wedding management needs. Allow brides/grooms to state what they're interested in, then notify the suppliers to allow them to make direct contact with the brides/grooms via the site. If you have any great ideas or suggestions for features we could add to Wedding Wishes UK, please let us know! You can write your comments below, or contact us by email or twitter. We want to make this a great resource for brides/grooms as well as suppliers.